Although I enjoy making crafts and doing art activities with my little one, let it be known that I don't like cleaning up a big mess (really? A mom who doesn't like messes? What a surprise!). So when I choose art projects I try to pick things that are easy set up and easy clean up (just see my posts on EASY DIY Play Dough and EASY DIY Chalk Sand Art!). Marble painting was one of those crafts for us. Quick and fun, the clean up wasn't too bad and the mess was pretty self-contained. Place your paper in your tray and set up your paints. We chose to use three colors but you can use as many as you want. I put our paint in paint trays but you can also put them in paper cups if you don't have trays. Drop a marble in each color and make sure you swish it around in there to pick up the color. Using your plastic spoons, pick up each marble and drop it onto your paper. Then, pick up the sides of your tray and tilt it to move the marbles around. 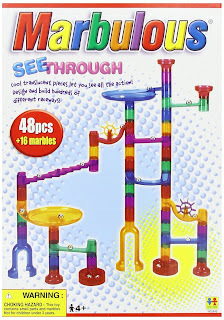 The marbles will make a "trail" of paint! You can cut the paper into different shapes, use it as wrapping paper, or even make greeting cards with it. For added fun, check out one of our favorite games called Marbulous (you can purchase it through my Amazon Affiliate link below). There are a lot of different versions of it (this is the "see through" kit) and they come in various amounts (we have the largest set with 121 pieces). It's one of our favorite old school toys. My son will sit for long periods of time either building or sending marbles down the run. He even brought it to show and tell in his preschool class! My husband also builds elaborate runs with him that stretch across the whole room. As I type this, there is a Marbulous run in front of me that my son is playing with, and it cascades across our coffee table and down onto the floor via some foam blocks that they incorporated into the maze. Cool! For marble fun or supplies for your marble paintings, check out my Amazon affiliate links below. It would make me SO happy if you did! This looks so much fun. A great activity to do with your kids. And the paintings looks awesome!